The Kimberley region of Western Australia is one of the world’s largest yet most uninhabited wilderness areas. It's an amazing place to tour, from it's rugged sandstone plateaus to it's picturesque waterfalls and hot-springs, there is something here for everyone. Our 7 day Kimberley tour from Kununurra to Darwin takes in many of the Kimberley's highlights including El Questro, the Bungle Bungles and Lake Argyle. It's an accommodated tour staying in luxury safari-tents, cabins and lodges along the way. This Kimberley tour is generally run as a private charter but can be offered as a small-group tour on request. Today you will be collected from the Kununurra Airport for the beginning of your 7 day Kimberley tour. This morning we will travel south from Kununurra to Purnululu National Park, home to the ‘Bungle Bungles'. Purnululu’s landowners, the Kija tribe, occupied the Bungle Bungle Ranges throughout the wet season to take advantage of the abundance of food and material resources. Only few Europeans knew of its existence until the late 1980’s. 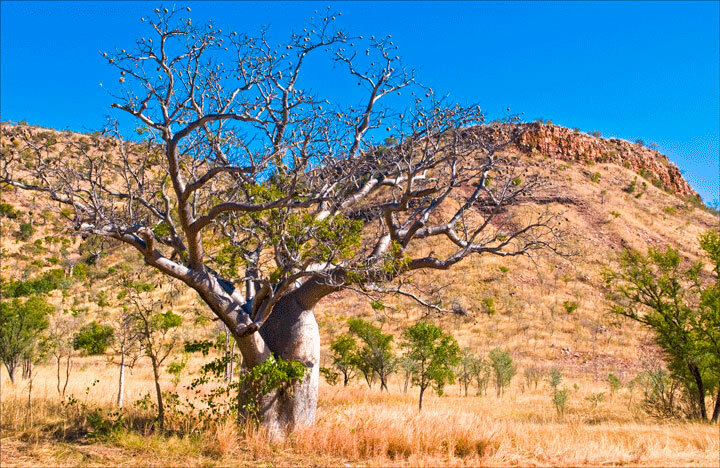 Today Purnululu is World Heritage listed and is globally recognised for its incredible landscapes. To enter Purnululu we turn of the Great Northern Hwy and make our way along a 50km 4wd track crossing several creeks and valleys which offer breathtaking views over the spinifex ranges. This afternoon we have time to explore the famous orange and black beehive domes before finding a secluded area to watch the sunset illuminate the Bungles. The second half of the track you will find yourself walking through towering red sandstone walls with a gap less than a few meters wide. For those keen for further adventure, you can scramble your way over rocks right to the end of the chasm. Today we make the journey north to El Questro Wilderness Park, our station stay for the next two nights. Formerly a working cattle station known as El Questro Station, this million acre land hold is pristine, rugged country which offers opportunities to swim, hike, fish, four wheel drive and more. Before breakfast we will travel to Zebedee Springs, where small thermal pools (32 degrees all year round) are situated in a pocket of lush and tropical Livistona and Pandanus Palms. As this is the coolest period of the day it makes it the perfect time for a morning bathe, all without the crowds! Return to base for a cooked breakfast before exploring Emma Gorge. Emma Gorge is a spectacular gorge that can only be reached by an invigorating 1 hour walk along a shaded creek bed. Set at the base of a 70m high cliff, this unique gorge has quite a mystical feel about it, with both cool and warm springs which are great for swimming. After the walk enjoy a freshly cooked lunch at the Emma Gorge Resort restaurant. This evening we will have sunset drinks overlooking the Pentecost River and Cockburn Ranges from the top of Branco’s Lookout. After a leisurely morning at El Questro we’ll travel back through Kununurra and further east to our last stop in the Kimberley region; Lake Argyle. Upon arriving at Lake Argyle we will check into our accommodation before boarding a sunset boat cruise. This cruise is not only scenic but very informative as you’ll learn more about the rich history of the region from your knowledgeable guides. This morning we will depart Lake Argyle for Keep River National Park where we will cross the border into the Northern Territory. Keep River is well known for its spectacular geology and hosts notable species of birds and marsupials within the sandstone environment. The Miriwoong and Gajirrabeng people have also lived here for thousands of years. As a result there are various sites scattered throughout the Park containing evidence of their occupation. This includes two rock-art sites which we will hike to this morning. Next, we will begin to make our way east along the Victoria River to Katherine. Once in Katherine we will travel straight to Nitmiluk National Park, home to Katherine Gorge and our luxury accommodation for the night. After breakfast enjoy a leisurely morning as we explore Katherine Gorge by canoe. Canoeing through this pristine wilderness area enables you to experience the gorge at its best. Enjoy the whole morning paddling through the first gorge at your own pace. Next, we will depart Katherine and make one more stop on our way back to Darwin visiting Edith Falls for a swim and afternoon tea. Arrive in at your Darwin accommodation at approximately 06:00pm. This ends your Venture North 7 day Kimberley tour. Please note this tour can also be done in reverse as a 7 day Kimberley Tour from Darwin. If you would like more information about this tour or any of our other Kimberley tours please don't hesitate to email us or call (08) 8927 5500.